The State Government has today announced a further nine new train services every week will be added to the Ararat line, on top of the 10 announced last month. 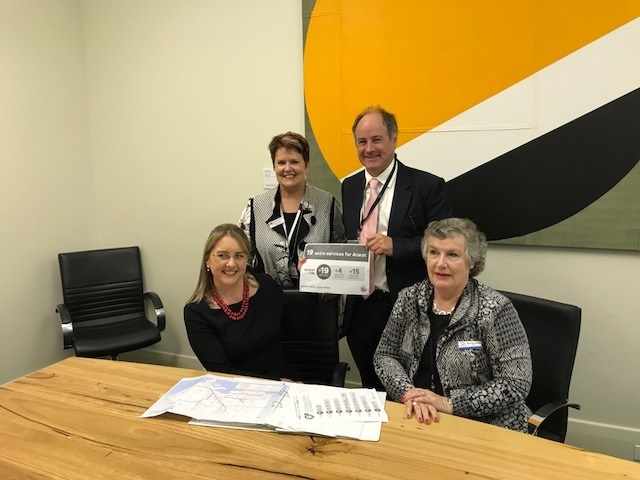 Ararat Rural City Council Mayor, Cr Paul Hooper with Minister for Public Transport Jacinta Allan, Southern Grampians Shire Mayor, Cr Ann Maree Brown Mayor and Horsham Rural City Mayor, Cr Pam Clarke. Ararat Rural City Council Mayor, Cr Paul Hooper this week met with Minister for Public Transport Jacinta Allan, who announced that 19 new weekday and weekend services will start running on the Ararat line in August – reducing waiting and providing more choice to for local passengers. The nine extra services include the extension of an existing weekday afternoon Ballarat service to start in Ararat, and four new weekend services. On Saturdays and Sundays, a new late morning service will run from Ararat to Ballarat, and an early afternoon service from Melbourne to Ballarat will be extended to Ararat. Late morning services on weekends will give locals the opportunity to travel to Melbourne for footy games and other events by train, while the new afternoon service allows people to get back to Ararat earlier in the day. The extra services announced last month included a weekday morning service departing from Ararat Station and connecting with a Melbourne bound train at Ballarat, and a weekday afternoon service departing Southern Cross, extended to Ararat. Ararat Rural City Council Mayor, Cr Paul Hooper said the 19 new extra weekly train services was the result of years of lobbying and hard work. “Last month’s announcement was very pleasing and these further new services are just the icing on the cake for the Ararat Rural City,” Cr Hooper said. The new V/Line timetable that will start in August will add 151 extra across regional Victoria, on top of the 80 new services that started in January – taking the total number of new V/Line services added by the Andrew’s Labor Government to more than 500. The extra services will create room for thousands of extra passengers across the regional network and would be further boosted by the Regional Rail Revival package announced last month. The new services will start in August and timetables will be available for download from ptv.vic.gov.au in July.